Tomas Mrazek continued to the finals from the semifinals from 4th position. Silva Rajfova ended in semifinals 13th. 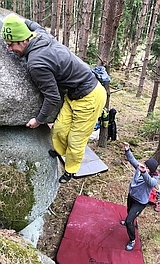 Tomas Mrazek (CZE) was 3rd today on European Championship in bouldering in Birmingham, UK. Silva Rajfova (CZE) finished 8th. Spain Adam Ondra and co.